Addressing one of his rallies,Modi attacked Arvind Kejriwal directly by calling him a Pakistani Agent. He said India had three AK’s emerging as Pakistani commanders on Indian side – First,AK47 which was used by Pakistan to bleed India.Second,AK Antony,the Union Defence Minister,who had stated in the Parliament that people who beheaded Indian soldiers were wearing the dress of Pakistan army, while army said Pakistanis had come.Last July,Pakistani army had intruded in the Indian side and beheaded two Indian soldiers. 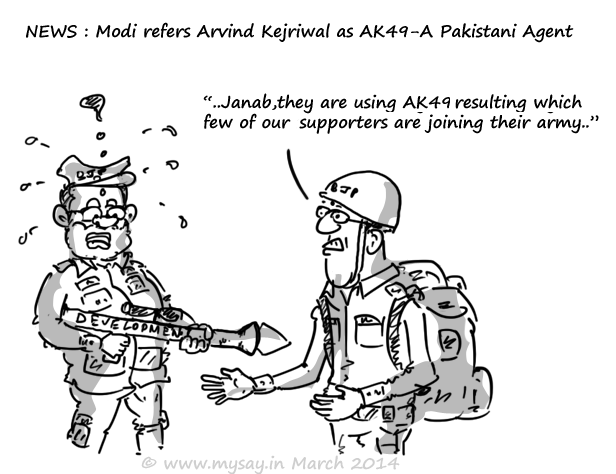 The third,Modi mentioned,was AK49 which has launched a new party recently. This was a mock at Arvind Kejriwal’s 49 day old govt in Delhi. AAP has emerged as a strong vote-cutter for BJP in 2014 which was quite visible in Delhi polls where BJP could not make its Govt despite Congress losing real bad.